In 1970 the average slice of pizza had 500 calories and now it's up to 850 calories! The most expensive pizza, commercially available, is a thin-crust, wood fire-baked pizza topped with onion puree, white truffle paste, fontina cheese, baby mozzarella, pancetta, cep mushrooms, freshly picked wild mizuna lettuce and garnished with fresh shavings of a rare Italian white truffle, itself worth £1,400 per 1 kg. Depending upon the amount of truffles available each season, the pizza is regularly sold at £100 each to customers of Gordon Ramsey's Maze restaurant, London, UK. Add 1/2 a teaspoon of sugar and dissolve it in lukewarm water. Dissolve the dried yeast in this water and leave it aside for 6-8 minutes. Take two cups of flour. Season it with salt. Make a well in the middle of the flour and add the yeast dissolved water. Add a teaspoon of extra virgin olive oil and mix it. Knead the dough till you have a even elastic product. Place the dough in a bowl and drizzle it with extra virgin olive oil. Cover the bowl with cling film and let it rise for 50 minutes to 1 hour. After the dough has risen, divide it into balls, dust the working surface and the rolling pin with flour and then roll out the dough. Take two cups of tomato puree or passata in a sauce pan. Drizzle it with freshly ground black pepper and 1 teaspoon of virgin olive oil. Add 1 teaspoon of dried garlic powder and 1/2 teaspoon of dried crushed basil. Let it simmer for 10-15 minutes while stirring it occasionally. When the puree has incorporated the flavors of garlic and basil, the sauce for the topping is ready. Add a thin layer of this sauce on top of the crust. 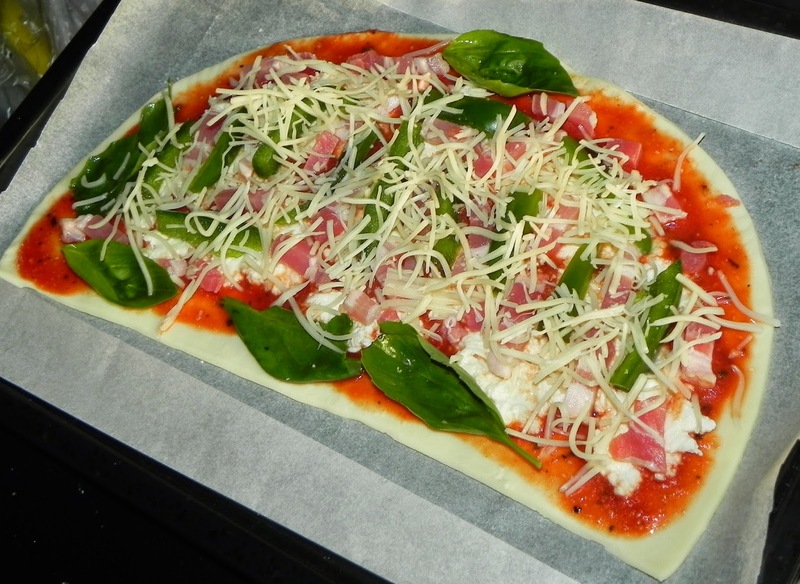 Then cover this with a layer of smashed mozzarella. Place the lardon and green bell pepper on it. Cover this with a layer of grated emmental. Garnish it with fresh basil leaves. Then put it into a preheated oven of 200-220°C for 15-20 minutes depending on the thickness. 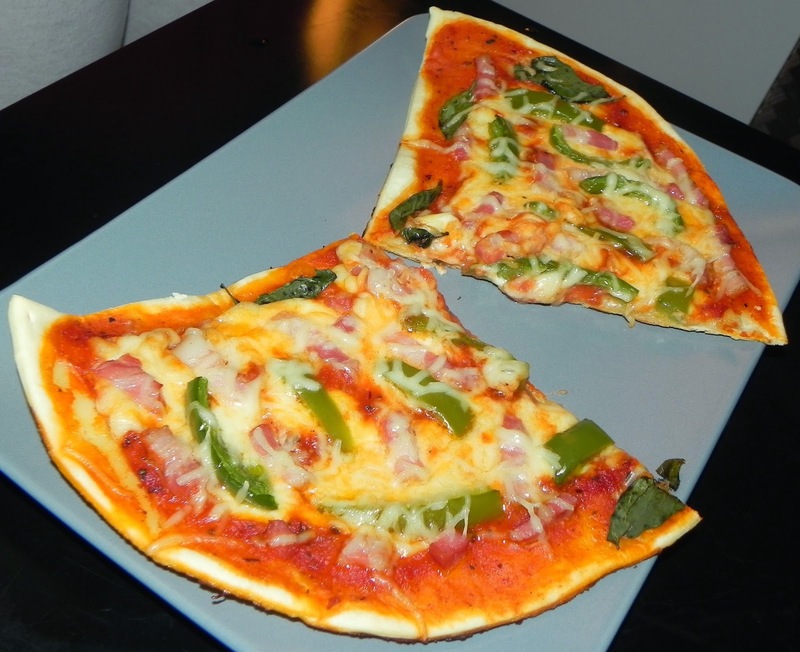 Voila now enjoy the pizza served with sprinkled Chili oil. Buon appetito!